The bamboo plant is a rapidly growing plant with some variations growing up to three inches per day. This spreading plant thrives in tropical climates and produces strong, sturdy culms that are often used for types of commercial construction. Healthy bamboo can thrive well in indoor and outdoor environments and will grow for almost anyone. Generally, small bamboo plants are young plants that will, eventually, grow into a much larger plant. Place the bamboo plant in a warm, sunny location that receives at least six to eight hours of full to partially shaded sunlight each day. Ensure that the bamboo is kept away from sources of direct temperature variations, such as heating vents and air conditioners. Irrigate the bamboo plant regularly and avoid incorrect irrigation levels. Irrigate the bamboo only according to its needs. Check the soil’s moisture levels prior to watering by placing your finger about an inch or two deep into the soil. Irrigate the bamboo when the soil feels somewhat dry. Irrigate thoroughly until the excess water runs from the container’s drainage system. Allow the plant to dry between watering. Feed the bamboo to promote a vigorously growing plant. Provide the bamboo plant with a fertilizer with high levels of nitrogen, such as a 21-5-6. Select a well-balanced fertilizer, such as 20-20-20 or 30-30-30, if you are unable to locate the higher nitrate feeds. Distribute the feed evenly in the soil at half strength and water the fertilizer into the soil. Avoid placing the fertilizer directly on or near the culms to prevent burn. Feed the bamboo approximately every 30 to 45 days during the growing season. Prune the bamboo once each year in the early spring. Cut away older culms to redirect the energy to the young, more vibrant culms. Use sharp, sterile pruning shears to cut the culms down at soil level. Trim foliage base on the desired appearance. 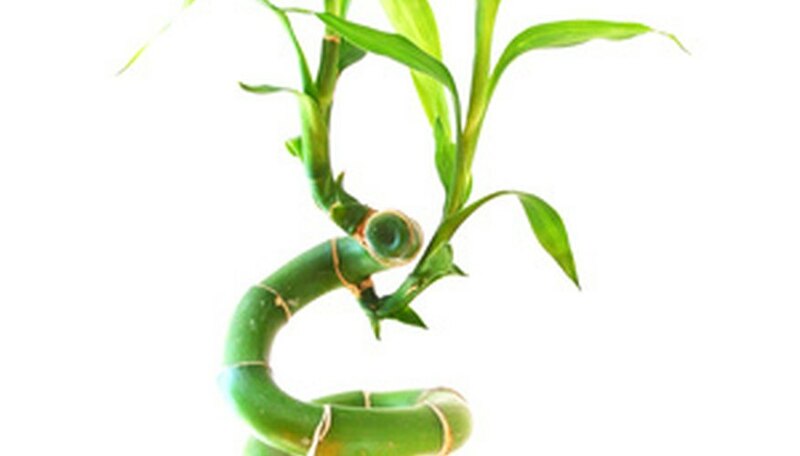 Repot the bamboo plant at least once each year or as required to keep up with the vigorous growth. Remove the bamboo plant from its container and remove the excessive soil from the rhizomes and roots. Reduce the clump and spread of the plant by cutting the rhizomes with a sharp, sterile knife. Repot the bamboo plant in fresh, nutrient-rich soil. Line the bottom one-third of the container with soil. Position the bamboo plant in the center and fill the container with soil. Press the soil firmly around the bamboo to secure its upright position. Irrigate the newly repotted bamboo immediately after completion.